Indie squad tactics game Fray seems purpose-built to secure a place on RPS’s radar, and since we have impeccable taste, that means you should be keeping an eye on it too. Not only is it going to offer top-down squad strategy, they’re appealing to RPS’s love of paradoxes- that same squad strategy will be real-time and turn-based. Don’t think about that too hard, because (1) you’ll get a headache, and (2), we’ve got an interview with French developers Brain Candy explaining just what Fray is after the jump, as well as the first ever screenshots. Before we get started, you may want to take a look at the two promotional videos Brain Candy released for Fray up till now. I liked them both quite a lot, the first because it had heart and a sense of humour and basically showed what happens when indie devs get their hands on tens of thousands of euros worth of mo-cap equipment, and the second because it was as shiny and professional a bit of viral marketing as I’ve ever seen come from an indie studio. And with that, on with the interview with Monsieur Alexandre Avenard, lead producer at Brain Candy. RPS: Greetings! So, simultaneous turn-based strategy? You’d better explain how that works, before the heads of our readers cave in like rotten fruit. Alexandre Avenard: Bonjour RPS! Simultaneous turn-based strategy… Quite a mouthful isn’t it? 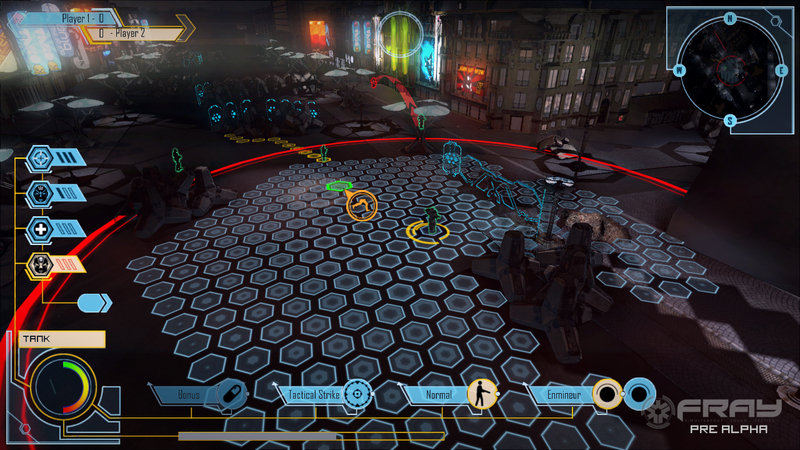 In traditional turn-based games, players take turns to give orders to their squads, armies or characters, one after another. While this system works wonders in single player games, it can be a problem in a multiplayer context, where a game can drag on and on. This is where we believe simultaneous turn-based strategy truly shines. By allowing every player to choose their actions at the same time, we can create a very dynamic strategy game, even with a high number of players, since you don’t have to wait for your opponents. Once everyone in the match has given their orders or a fixed timer has run out, you then witness how your actions pan out in a cinematic fashion. 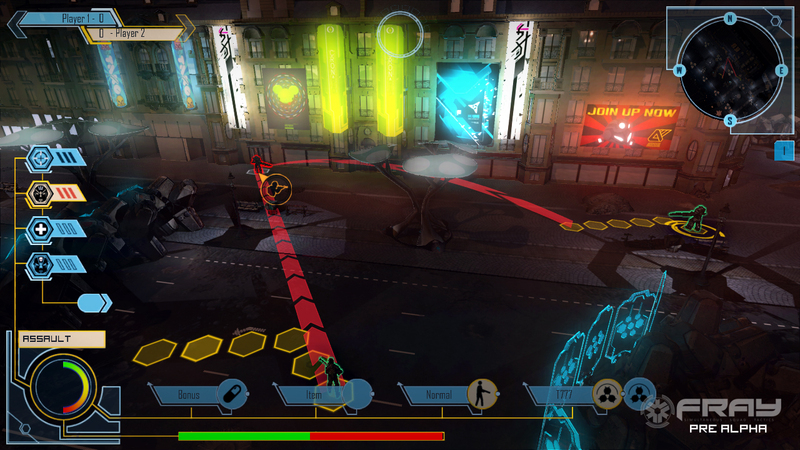 With this system in place, Fray is much more action oriented than traditional turn-based strategy games. You have to anticipate the enemy’s actions, put yourself in their shoes, and lay out traps and ambushes, with virtually no down time, rather than just reacting to their actions. It is a very different feeling that just has to be tried! RPS: How tense is each turn’s time limit? Is it enough time for some chin-stroking and second-guessing, or do you often send off orders in a blind panic? RPS: Presumably if you’re asking players to send if orders quickly, you can’t have any wrestling with the UI. Do you guys have an innovative control scheme in place? AA: David, our lead designer, used to work as a usability expert and designed interfaces for many different products. When working on Fray, he wanted to streamline the way orders are given and ease the players as much as possible, letting them focus more on the gameplay and have less fumbling around with different options. We looked at how interfaces in RTS’ are managed, since they also are fast paced, and created our own little melting pot that will allow players to issue orders swiftly and efficiently. The UI seen in the screenshots is still a work in progress but gives an idea of what we are aiming for, with rapid selection and recognition of each squad member and quick issuing of orders. The gameplay is also tuned in this sense, taking cues from action games and FPS, focusing more on the strategy and the fighting, rather than micro-managing the team, which will take place outside of a match (assigning weapons, skills, equipment etc). 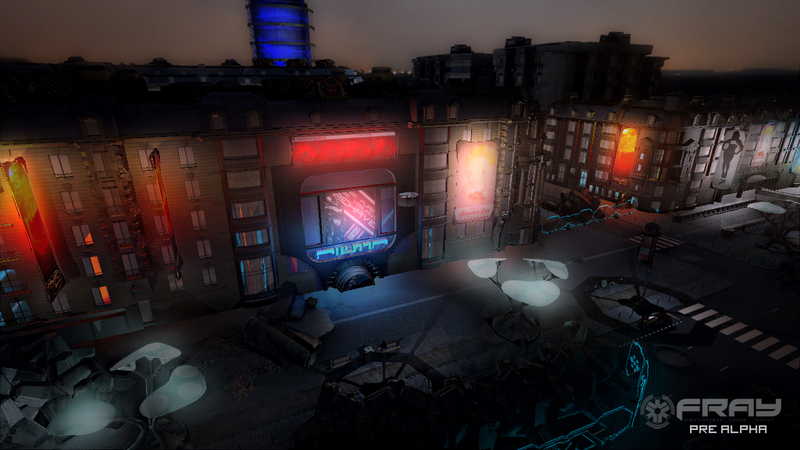 RPS: What did you guys think of (or learn from) Frozen Synapse? AA: Frozen Synapse is an awesome title that we really recommend to RPS readers, paving the way back to great turn-based strategy games on PC. We discovered it a few months into our own development and we were surprised to see that Mode7 was designing a game with similar design principles to Fray. It really comforted us in our choice of simultaneous turn-based in a multiplayer situation, truly speeding up the pace of the game, creating new and intense situations, while retaining the core aspects of what makes turn-based games so successful. Both games are however quite different in flavor, as we had decided on many different design choices in Fray prior to hearing about them, such as different character classes, a persistent evolution system for your team, more akin to an RPG, with XP, levels, weapon and equipment unlocks that allow players to fine-tune their team as they progress in the game, players will focus on one game at a time rather than multiple games at once as in Frozen Synapse, and our rounds are timed, forcing players to make quick decisions, similar to what they would do in an RTS or an action game. Despite our differences, we believe that innovation in gameplay is the key and Frozen Synapse has proven to us that players are hungry for new ways to play strategy games. Being an independent developer allows us the freedom to take these chances with new forms of gameplay. RPS: What would you say is the core of squad-base strategy? Why is it proving so hard for the games industry to recapture what made people fall in love with the classics- Jagged Alliance 2, X-Com, and so on? AA: The major challenge for a player in a squad-based strategy game is to find out how to interact with several different characters, each with their own equipment or abilities, and create an effective strategy against opponents that possess similar or different squads. 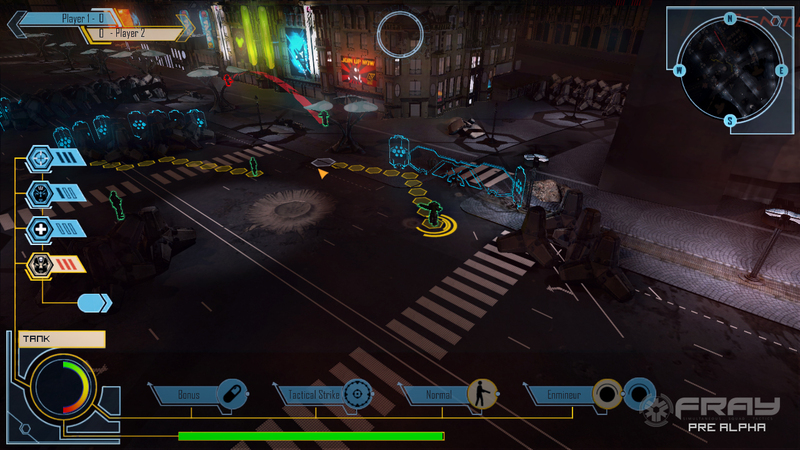 To be successful, the player must create team-play between his different characters, using their unique qualities and the combat environment in order to anticipate or react in the best way possible to the enemy squads’ actions. 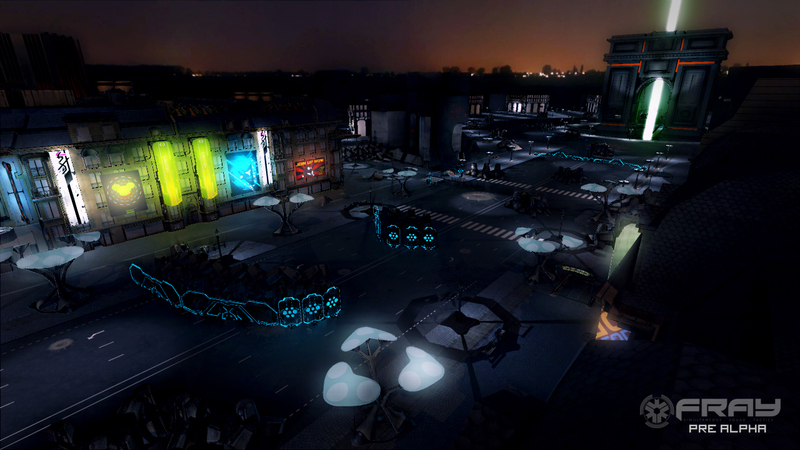 Traditionally, squad-based strategy games have used turn-based mechanics. The problem is that their design is very close to that of a board game, imposing gaps in the game’s rhythm in order to give your orders to each character, and let the enemies play. In the era of X-Com and Jagged Alliance, this type of gameplay was common, it was the beginning of 3D on computers, and consoles were still a small market. But with increasing processing and graphical power, games became more and more fast paced, and technological evolution was pushed through real time games, where the majority of players have their interests. The biggest problem with today’s gaming industry in regards to squad-based strategy, is that real-time is not the right fit for the genre (although Dawn of War 2 would say otherwise), and they are traditionally turn-based, a genre which scares the big majors, as it is considered too niche. That doesn’t mean that the genre is necessarily dying, new titles come out each year, but its public is unfortunately limited, mostly because most gamers don’t even know of the genre, having discovered gaming in the past ten years. Gamers must therefore count on independent studios to satisfy their tactical needs, to challenge their reflection after a fast paced action game, where twitch mechanics rule. 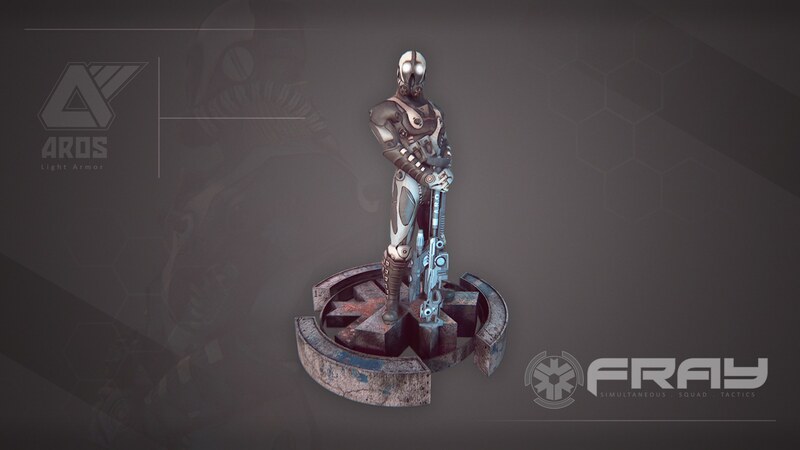 With Fray we hope to introduce FPS gamers to strategy games, with an action packed game that also requires some thought. RPS: Your favourite squad-based strategy game! GO! AA: The team will answer in unison: XCOM!!! Although I personally have a soft spot for Final Fantasy Tactics, but shhh! That’s heresy here! RPS: I saw in a preview that you guys said you wanted to use Fray to, in part, show that Unity can be used to create indie games with near next-gen graphics. How’s that working out for you? AA: Unity is an awesome engine, quite underestimated by a lot of people. With the pro version, you have access to many of the tools that would be available only in top-end game engines such as the Unreal Engine 3 or the CryEngine 2. Maybe not that high standard from the get go, but with a good programing team, you can get close to their quality. Since in Fray, the game camera can get very close to characters and the environment during the cinematic resolution phase, we wanted to have the best graphics possible with our small team of 10 people. Thanks to our programmers, we managed to create many different shaders to enhance the visuals of Fray, such as global illumination, ambient occlusion, custom glow, depth of field etc. Combine that with the Beast light mapping engine (used in Mirror’s Edge) available in Unity and you get quite a pretty game! Of course, it is not simple, it requires many hours of work, tuning and tweaking everything, creating all the art assets and building the levels, but with commitment, Unity is one of the best engines out there, and definitely the one that has the most bang for your buck. Tagged with Brain Candy, feature, Fray, indie.